Sure, everyone loves Coopers Rock's vistas. But there’s a ton more to explore at this unique park, too. That panorama of crag outcroppings, blooming rhododendron and rolling hillsides is show-stopping, but you can scale those cliffs, hike among those wildflowers and mountain bike that boulder-riddled terrain. 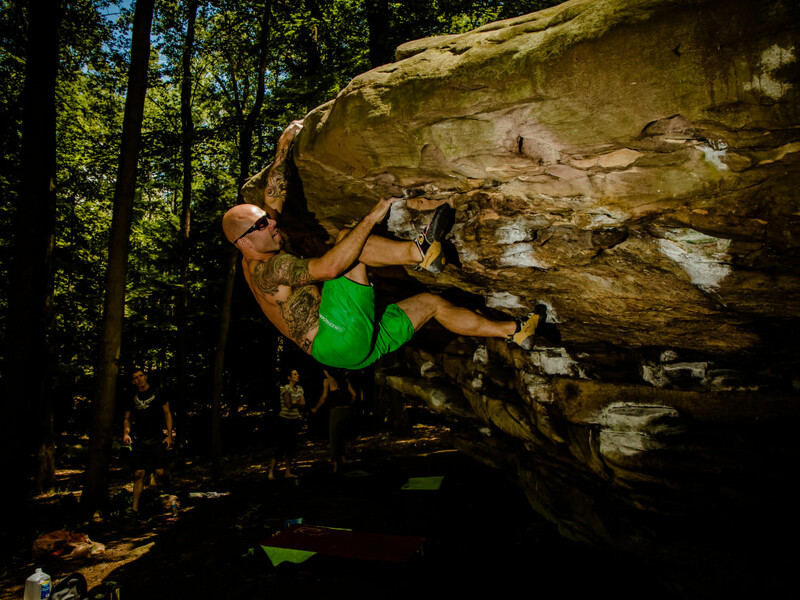 Coopers Rock has both bouldering and top rope climbs. There is a range of grades, from non-technical scrambles and moderate chimneys to gravity-defying overhangs. 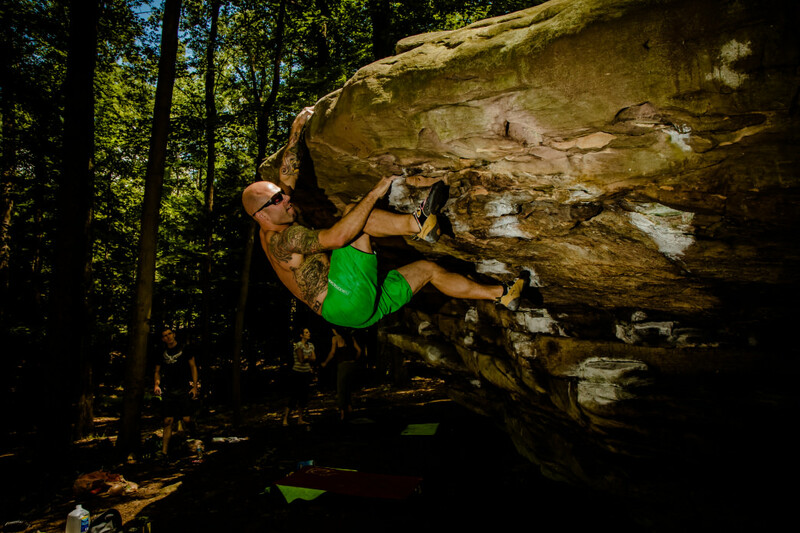 The most popular climb is just 100 yards past the "Climber's Kiosk" in the large parking lot on the main road from the Coopers Rock I-68 Exit. The crack is called Mister Clean (5.7, 30 feet). It's in a narrow alleyway to the right of the main hiking path that heads to the Sunset Wall area and right off the river valley. In the same area, try the wandering face Full Moon Afternoon (5.6, 40 feet) up crescent-shaped features, the diagonal finger crack called Zig Zag Wanderer (5.7+, 40 feet), the slightly less challenging Access Crack (5.3, 22 feet), which is a stairstep climb up a secure open book feature. On the other side of the parking lot take the Rattlesnake Trail to another set of climbs. You'll find a number of chimney structures with climbs that range from 5.4-5.11. Coopers Rock is home to some incredible moderately technical mountain biking. While it isn't as technical as some parks like Big Bear Lake, you can ride the trails fast, which makes it very fun. There are a lot of rocks, roots and other trail features to keep things interesting. Get ready for climbing— there’s plenty of it, followed by rewarding descents, followed by more climbing. Expect the occasional narrow bridge, fallen tree or log pile as you pedal, and keep an eye out for some very cool historic stone structures as you twist and turn through the interlocking trails. Just be sure to ride the south side of the park. The north side allows riding, but it still has the "wild" feeling of "Wild, Wonderful West Virginia." If you're interested in checking out the north side of the park, though, be prepared to see some incredible scenery. You don't need a mountain bike to explore the interwoven trails of Coopers Rock. By trekking on foot, you’re able to take in all the small and magical details of this beautiful, historic place. For a long day trip, go past Ravens Rock Trail to the Sunset Wall Trail. Here, you can see rock climbers making their way up the high, flat rocks that hug the right side of the trail. Make your way to the Underlook Trail then up to Haystack Rock to get more epic views of the park. Continue hiking along trails with epic names: Rattlesnake, Rock City, Ridge Trail. You'll find yourself in the area of Mont Chateau, and will eventually come across the Henry Clay Iron Furnace on the Clay Run Trail. What better way to experience the quiet wonder of West Virginia than taking to the trails on a pair of cross-country skis? Because of the rocky, rooty nature of the trails, watch for at least 6 inches of snow for snow sports. You can enjoy the same trails year round, and they are great for intermediate cross-country skiers. In the center of the park, on the south side, there is a designated intermediate ski trail and advanced ski trail. Other popular ski trails are Eagle Trail, Rock City Trail and Roadside Trail, which will give you a serene and relaxing Coopers Rock experience— and a solid workout. 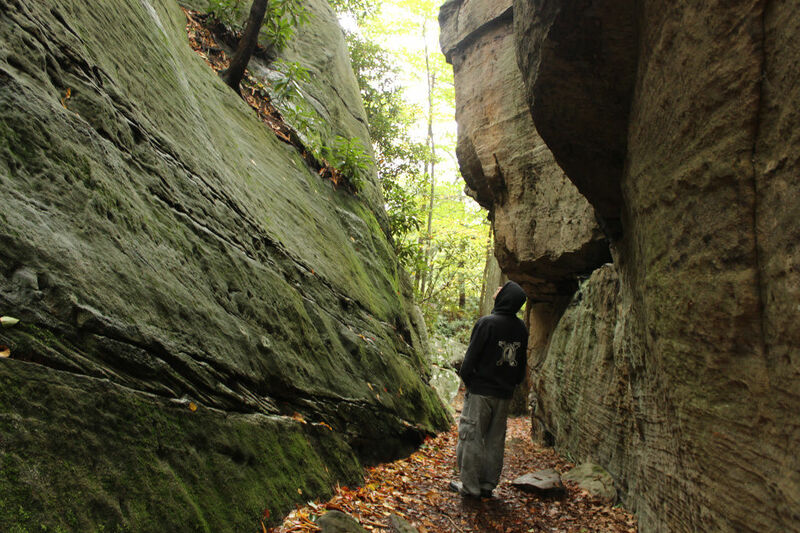 Explore more in Coopers Rock State Forest.